Website for a national bird control company. 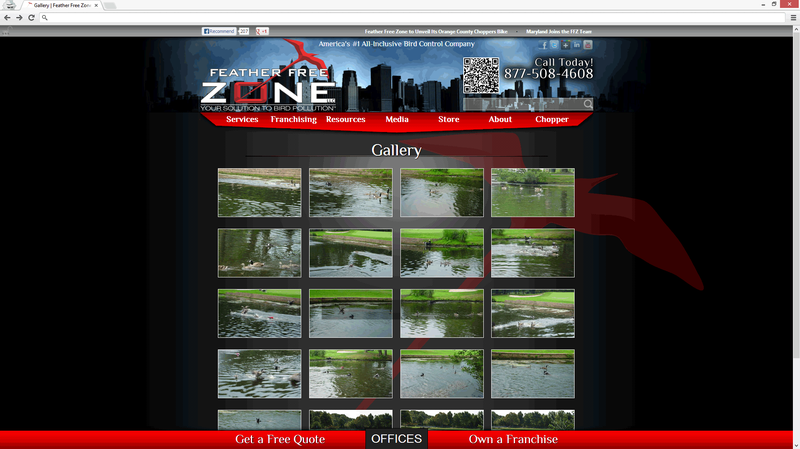 Feather Free Zone had me refresh their website for them in mid-2011. Having worked on the initial website (which I do not have shots of) -- which was admittedly rushed due to timing restrictions -- having the opportunity to revisit it so soon was great as I was also given more flexibility to experiment with things in order to differentiate their site from the competition. The timing of the overhaul coincided with the Fall premiere of the American Chopper episode which they appeared on. The idea was to take the simple, safe layout we had already established and toss in elements, which were agreed upon, into the layout in order to provide a unique experience. Following the premiere of the American Chopper episode, we received praise by visitors for the fun-yet-easy experience the site provided. 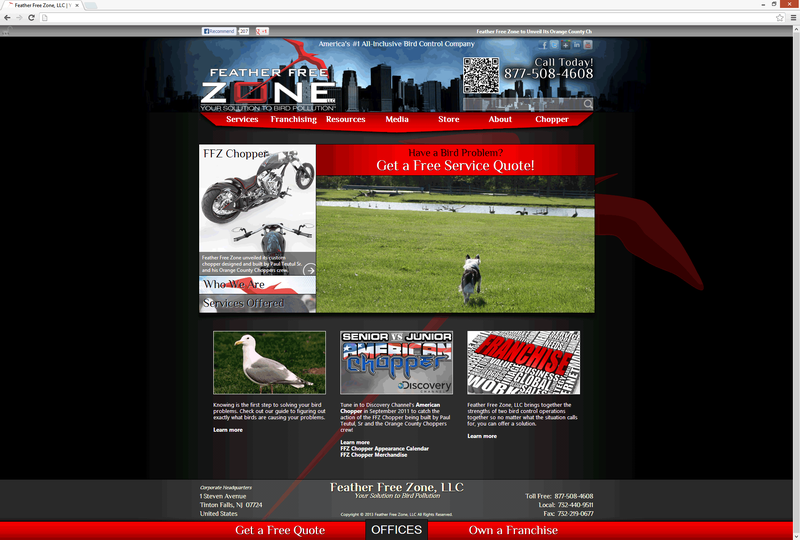 Front page of the Feather Free Zone website. The introductory page was made up of a 'featured' section which contained an accordion menu on the left that contained 3 featured sections, a quick 'Get Service' link on the top-right, and a large photo slideshow on the bottom-right. Below that were 3 more 'featured items' modules. The website was built on a Wordpress backend using CSS and jQuery for all the main elements. The most experimental features were the scrolling, sticky drop-down menu and the 'Offices' tab which, when clicked, opened upward and allowed visitors to scroll left or right to select their own state which would take them to a custom state-focused version of the Feather Free Zone site. Custom jQuery drop-down menu navigation. Scrolling the page would cause the menu to 'stick' to the top of the window to offer faster access to navigation to switch between pages. Custom hidden carousel for selecting which state you needed service in. Clicking on a state would jump to the appropriate state's custom Feather Free Zone page. This Disclaimer page is a simple demo of how standard sections were laid out. Most of the content had not had images provided for them, so text spacing and layout was extra important. Simple photo gallery which, when an image was clicked, would open in a Lightbox window within the page. 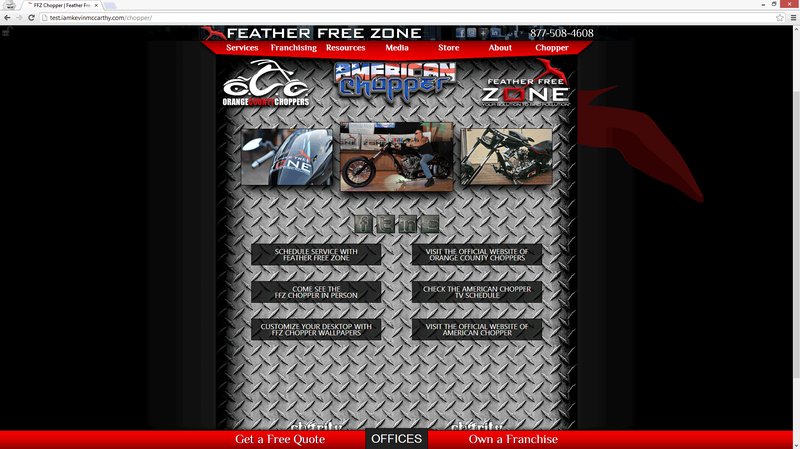 Custom page layout for their Chopper-dedicated section. With the exception of a calendar subpage (below), it was structured to simply provide shortcuts to external sources on the chopper and the American Chopper show. 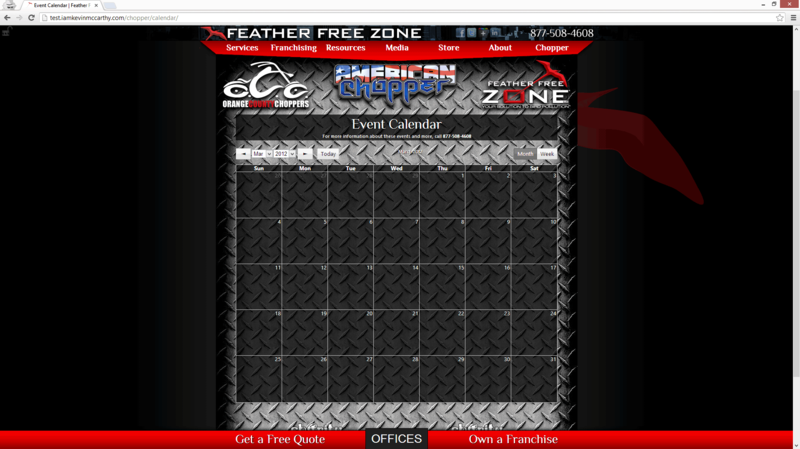 Calendar for Chopper events which was powered by AJAX and jQuery.